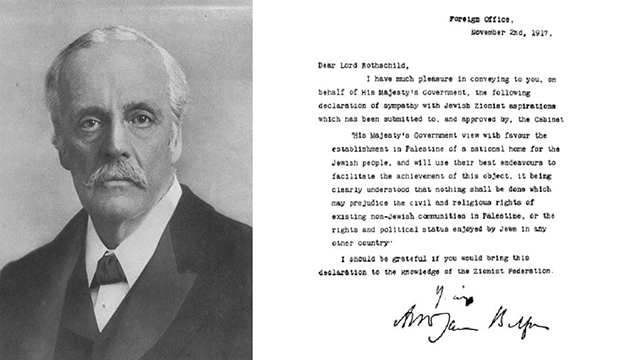 In a letter dated November 2, 1917 from British Foreign Secretary Lord Arthur James Balfour to Lord Walter Rothschild, a leader of British Jewry, the British government stated its support for “the establishment in Palestine of a national home for the Jewish people…” The contents of the letter became known as the Balfour Declaration. At the 100th anniversary of this milestone event in Jewish and Zionist history, a panel of scholars of British, Middle East and Jewish history and politics will explore the Balfour Declaration’s origins and its significance for today. Issues to be addressed include: the circumstances that led to the declaration; its impact on the Zionist movement at the time; its influence on diaspora Jews’ connection to the land of Israel/Palestine; and its relevance for current debates about the future of the region. Jonathan Schneer is the modern British historian at Georgia Tech in the School of History, Technology, and Society. Dr. Schneer is the author of The Balfour Declaration: The Origins of the Arab-Israeli Conflict which won a 2010 National Jewish Book Award, as well as six other books including, most recently, Ministers at War: Winston Churchill and his War Cabinet; London 1900: The Imperial Metropolis; and The Thames: England's River. He has published articles in leading scholarly journals and collections of essays. He was a founding member of the Radical History Review and served as its book review editor for seven years. He also served for many years on the editorial board of Twentieth Century British History, and is a member of the advisory board of the London Journal. He has received fellowships from the Whiting Foundation, the American Council of Learned Societies and from numerous Oxford and Cambridge colleges. In 2003 he was the Visiting Senior Research Fellow at St. John's College, Oxford. At Georgia Tech, Professor Schneer teaches modern British and modern European history to undergraduate and graduate students. Ian Lustick is Professor and Bess W. Heyman Chair in Political Science at the University of Pennsylvania. Dr. Lustick is interested in comparative politics, international politics, Middle Eastern politics, and agent-based, computer assisted modeling for the social sciences. He teaches courses on Middle Eastern politics, political identities and institutions, techniques of hegemonic analysis, the expansion and contraction of states, and on relationships among complexity, evolution, and politics. Dr. Lustick is a recipient of awards from the Carnegie Corporation, the National Science Foundation, the National Endowment for the Humanities, the Social Sciences Research Council, the Middle East Peace Foundation, and the United States Institute of Peace. Before coming to Penn, Professor Lustick taught for fifteen years at Dartmouth College and worked for one year in the Department of State. His present research focuses on analysis of the fate of the “two state solution” to the Israeli-Palestinian conflict, developing agent-based models for solving complex theoretical and forecasting problems, and understanding the dynamics and vulnerabilities of anti-authoritarian political cascades. He is a past president of the Politics and History Section of the American Political Science Association and of the Association for Israel Studies, and a member of the Council on Foreign Relations. Mark A. Raider is Professor of Modern Jewish History in the Department of History at the University of Cincinnati and Director of the University’s Center for Studies in Jewish Education and Culture. He is also Visiting Professor of American Jewish History at Hebrew Union College-Jewish Institute of Religion. Dr. Raider has authored or co-authored numerous books, including The Emergence of American Zionism; Abba Hillel Silver and American Zionism (with Jonathan D. Sarna and Ronald W. Zweig); The Plough Woman: Records of the Pioneer Women of Palestine. A Critical Edition, (with Miriam B. Raider-Roth); American Jewish Women and the Zionist Enterprise (with Shulamit Reinharz); and others. His recent scholarly articles include “The Rise of Stephen S. Wise as a Jewish Leader” and “Stephen S. Wise and Golda Meir: Zionism, Israel and American Power in the Twentieth Century.” Professor Raider teaches courses on U.S. history, American culture, the American Jewish experience, modern Jewish history, and Zionism and Israel. Before joining the University of Cincinnati, he was the Founding Director of the Center for Jewish Studies at the University at Albany, State University of New York, and served as Director of the Posen Foundation Education Project, a countrywide interdisciplinary teacher education initiative focused on American middle school and high school teachers interested in Jewish history, culture, and literature. Shira Efron (Moderator) is a policy researcher at the RAND Corporation, a special advisor on Israel with RAND's Center for Middle East Public Policy, and a professor at the Pardee RAND Graduate School. At RAND, she is now launching a unique research program on Israel as well as continuing to research various Middle East topics including food, water and energy security, public health, technology adoption and more. Prior to RAND, Efron primarily conducted research and analysis on Middle East issues with a focus on the Israeli-Palestinian conflict. She was the policy director and country representative of the Institute for Inclusive Security in Israel. Previously, she was a policy analyst at the Center for American Progress, where she edited the Middle East Bulletin, a multi-weekly online publication for a high-level U.S. government and stakeholder audience focusing on the intersection of U.S. political, economic, and security interests in the Middle East and North Africa. Dr. Efron was also a research analyst at a hedge fund in New York, an editor at the Israeli newspaper Ha'aretz, and a reporter in the Israeli Defense Forces. Dr. Efron has a Ph.D. in policy analysis from the Pardee RAND Graduate School, an M.A. in international relations/international business from New York University (NYU) and a B.Sc. in biology and computer science from Tel Aviv University.